Elayn Martin-Gay's developmental math textbooks and video resources are motivated by her firm belief that every student can succeed. Martin-Gay's focus on the student shapes her clear, accessible writing, inspires her constant pedagogical innovations, and contributes to the popularity and effectiveness of her video resources. This revision of Martin-Gay's algebra series continues her focus on students and what they need to be successful. The Martin-Gay developmental math program offers a variety of print and digital resources so instructors can build the ideal learning solution for their students. The textbook, available in print or digital format, is the keystone of the Martin-Gay program. Elayn Martin-Gay is known for her accessible writing style and for the depth of resources she provides for instructors and students in her texts. Classroom Examples, paired with each example in the text, are available in the Annotated Instructor’s Edition for additional instructor support. All exercise sets have been carefully updated with this revision. Several special types of exercises throughout the text give students the practice they need: new Vocabulary, Readiness and Video Checks (see New-to-Edition section for more information); Guided Applications (see New-to-Edition section for more information); Mixed Practice; Concept Extension; and more! Martin-Gay’s presentation of Study Skills ensures that students make the most of their valuable study time in order to help them succeed in this course. In-text study skills resources include Section 1.1, Tips for Success in Mathematics and the new Student Resources section located in the back of the book. A complete lecture for each section of the text highlights key examples and exercises. New “pop-ups” reinforce key terms, definitions, and concepts while Martin-Gay presents the material. An easy-to-use navigation menu helps students quickly find and focus on the examples and exercises they need. Interactive Concept Checks measure students’ understanding of key concepts and common trouble spots. After the viewer selects an answer from several multiple choice options, Martin-Gay explains why the answer is correct or incorrect. Study Skill Builder Videos reinforce the study skills-related skills and concepts found in Section 1.1, Tips for Success in Mathematics, and in the Study Skills Builder exercises found in the Student Resources section in the back of the text. The Chapter Test Prep Videos help students during their most teachable moment–when they are preparing for a test. This Martin-Gay innovation provides step-by-step solutions for the exercises found in each Chapter Test. Complete solutions on video for all exercises from the Practice Final Exam (located in Student Resources) help students prepare for the real thing. Overview segments review key problem-solving strategies. The Student Organizer is designed to help students develop the study habits they need to be successful. This Organizer guides students through the three main components of studying effectively–note-taking, practice, and homework–and helps them develop the habits that will enable them to succeed in future courses. The Student Organizer can be packaged with the text in loose-leaf, notebook-ready format and is also available in MyMathLab. The Video Organizer encourages students to take notes and work practice exercises while watching Elayn Martin-Gay’s lecture series (available in MyMathLab® and on DVD). All content in the Video Organizer is presented in the same order as it is presented in the videos, making it easy for students to create a course notebook and build good study habits! The Video Organizer provides ample space for students to write down key definitions and rules throughout the lectures, and “Play” and “Pause” button icons prompt students to follow along with Elayn for some exercises while they try others on their own. NEW! Two MyMathLab course options are now available: a standard course and a Ready to Go course. Standard MyMathLab courses allow instructors to build their course their way, offering maximum flexibility and complete control over all aspects of assignment creation. The new Ready to Go courses provide students with all the same great MyMathLab features, but make it easier for instructors to get started. Each course includes pre-assigned homework and quizzes to make creating a course even easier. All videos from the Martin-Gay Interactive Lecture Series. Student Organizer (PDF) with hyperlinks to all video. Video Organizer in PDF format. Pre-made (and pre-assigned in the Ready to Go course) section-level homework assignments. Pre-made (and pre-assigned in the Ready to Go course) Practice Final Exam. Pre-made (and pre-assigned in the Ready to Go course) Video Check assignments for every section. Premade chapter review quizzes that are pre-assigned in the Ready to Go course and generate personalized homework assignments based on students’ quiz results. Pre-made (and pre-assigned in the Ready to Go course) pre- and post-test for every chapter. The Vocabulary exercises quickly check students’ understanding of the new vocabulary words. The Readiness exercises assess a students’ understanding of concepts that are necessary to continue with the exercise set. Guided application exercises offer prompts for setting up the problem and getting started with the solution process. These guided exercises help students prepare to solve application exercises on their own, and appear in a number of places throughout the text. The Student Resources section,located in the back of the text, gives students a variety of tools that are conveniently located in one place to help them achieve success in math. Study Skills Builders give students tips and suggestions on making the most out of their valuable time. These cover all aspects of the learning process, from class notes to homework. The Bigger Picture—Study Guide Outline covers key concepts of the course—simplifying expressions and solving equations and inequalities—to help students transition from thinking section-by-section to thinking about how the material fits into mathematics as a whole. This outline provides a model for students on how to organize and develop their own study guide. The Practice Final Exam helps students prepare for the end-of-the-course exam. 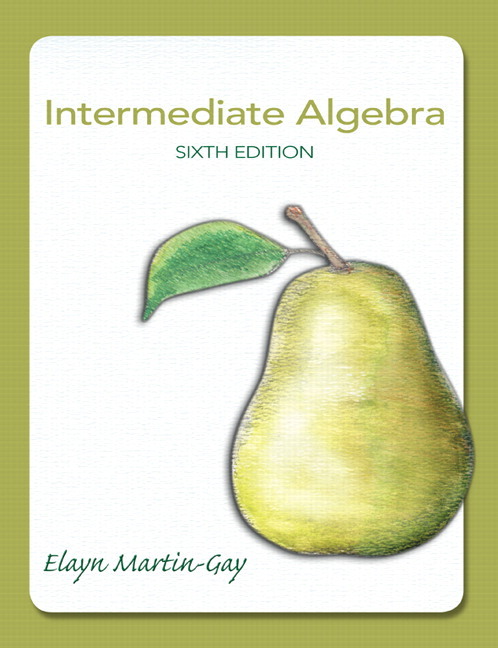 Students can also watch Elayn Martin-Gay work through the step-by-step solutions to all the Practice Final Exam exercises on the new Interactive DVD Lecture Series and in MyMathLab®. Answers to Selected Exercises allow students to check their answers for all odd-numbered section exercises. This Organizer guides students through the three main components of studying effectively—note-taking, practice, and homework—and helps them develop the habits that will enable them to succeed in future courses. An award-winning instructor and best-selling author, Elayn Martin-Gay has taught mathematics at the University of New Orleans for more than 25 years. Her numerous teaching awards include the local University Alumni Association’s Award for Excellence in Teaching, and Outstanding Developmental Educator at University of New Orleans, presented by the Louisiana Association of Developmental Educators. Elayn’s experience has made her aware of how busy instructors are and what a difference quality support makes. For this reason, she created the Instructor-to-Instructor video series. These videos provide instructors with suggestions for presenting specific math topics and concepts in basic mathematics, prealgebra, beginning algebra, and intermediate algebra. Seasoned instructors can use them as a source for alternate approaches in the classroom. New or adjunct faculty may find the videos useful for review. Her textbooks and acclaimed video program support Elayn's passion of helping every student to succeed.